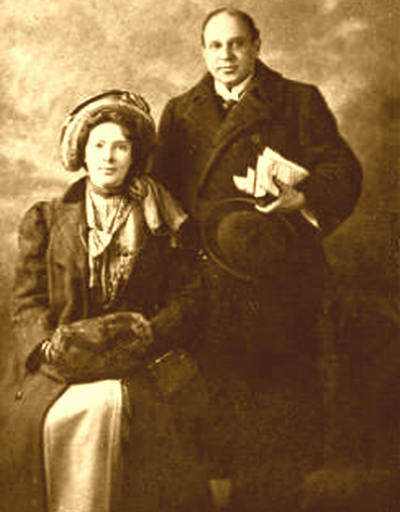 Constance Mary Margaret Morton nee Ewart and Joseph Thomas Vollam Morton. Marjorie Ross has researched the life of Constance Morton, mother of Ashton-born writer Henry Vollam Morton, who sometimes styled herself 'Cousin Maggie'. A few years ago I volunteered, along with five other ladies, to research the history of Ashton under Lyne Infirmary from 1861 to 1948 when it became part of the National Health Service. We were to produce a book on its history and a lot of incredible research was carried out but the powers that be, who collated the results and eventually produced a 'book of sorts', were not so enthusiastic and diligent and the result was (in my opinion) a complete fiasco. I had been asked by the H V Morton Appreciation Society (of which I am a member) to find out if the celebrated author's parents had done any writing of note during their spell in Ashton and about the name 'Cousin Maggie' which had been handed down in the family memoirs. Thus I volunteered for the hospital project and had started by reading through the huge collection of Ashton Infirmary Minutes, but I found most information about Maggie and Joseph in the microfilms of the Ashton under Lyne Herald. Cousin Maggie reigned in Ashton under Lyne from 1890 to June 1897. She was in some sense a creation, a self made invention, that existed purely for her few years living in Ashton. She seems to have made quite a stir amongst the population during her short stay in the town but also seems to have been instantly forgotten from the day she departed. The present is the last issue of the Herald under the proprietary of John Higham & Co - the great desire there was for a conservative journal in the district was shown by the way the announcement of the publication of the Herald was most enthusiastically received. When the first number appeared the encomiums passed upon it were of a most flattering description. The proprietors from this time forth will be of even more vigorous auspices - the gentleman into whose hands it has passed being determined that it will at once have a still wider area and still wider circle of readers. (the gentleman was Thomas Machell the Conservative Mayor of Stalybridge, a man who was to have considerable impact on the lives of Joseph and Constance Margaret Morton and their stay in Ashton under Lyne) With this object in view larger premises have been taken in Cavendish Street and the type an machinery of the best possible description and there is no reason why the Herald should not take the first position of any newspaper in the district. Whilst Ashton will be centre the branch office in Stalybridge will continue to open as heretofore an in due course we believe that likewise will be open at Mossley, Gorton and Openshaw and other populations in the district so that the conservative party will be adequately represented having an organ of their own that is intended will be second to none. Mr Machell was obviously the Rupert Murdoch of his day albeit if only in Greater Manchester. Joseph was 26 and Maggie was 30 years old. The age is debatable as she is on the 1861 census as 8 months old, on the 1871 she is 10, on the 1881 she 18 but on the 1891 she is 23. Yet her marriage certificate, 2 years earlier in 1889, shows her as 24 and on the 1901 census she is 30! On the 1911 census, when living in Kings Norton, Birmingham, she is 41, when in reality she must be approaching or reached the big 50. Her grand daughter Jo Walters recalls in her memoirs published by the H V Morton Appreciation Society, she was said to be 39 when she died -which would have made her 14 when she had her son H V Morton. Jo thinks Maggie was one of those women who stayed 39 forever. Maggie and Joseph initially lived in 46 Stamford Street, Cockbrook, Ashton - a typical working class two up and two down terraced house. I realised when researching Thomas Machell, the owner of the Herald, that he lived further down the same road in Stalybridge, in much greater splendour and must have found the first available lodgings for his new editor - it wasn't really in keeping with Maggie's supposed status. Joseph Morton stated he was an author / sub editor on the 1891 census. By the middle of 1891 they had moved into a much grander house - 17 Chester Square, next door to the Astley Arms, complete with mother in law Anne Ewart, aged 59. Young Henry Canova Vollom Morton was born there in June 1892. The Herald was published in the buildings on Cavendish Street across the road from the Armoury. Very easy walking distance from the family home and Maggie often seems to have walked there, especially on Saturdays, to supervise her column. I don't think she ever saw that much of Edinburgh. She never refers to Edinburgh in her reminiscences but often talks fondly of her summer holidays along the west coast of Scotland within striking distance of Glasgow. On the 1871 census she was living with her maternal grandparents, registered as a scholar, at Low Farm in Sutton St Helens Liverpool and on the 1881 she was working as a draper's assistant in Glasgow. As her business acumen in Ashton proved, think more Cherie Blair of nearby Crosby, less Miss Jean Brodie. Joseph, her husband, was pure British Raj, born in Buyar, Bengal, India, of Scottish stock. And if I hadn't been seriously looking for it I would certainly have missed it. One line dated 18th October 1893 remarking about gifts of flowers from the Rev Taylor and his church congregation and almost as an afterthought "and from Cousin Maggie". I didn't realise then, but do now, just why 'Cousin Maggie' was never going to be made much of by the doyens of the minute takers of Ashton Infirmary. She had made some serious social gaffes in the politically sectarian town of Ashton and had equally seriously ruffled some fine feathers. But, having read of her efforts and good deeds, I think she should be up there in the townsfolk's collective memory as an example to all as a lady who got things done and made a difference. In November 1896 Cousin Maggie organised a very successful 3 day Bazaar held in the Armoury, in which £1221-6s-31/2p (equivalent to £69,716-86p today) (in the previous January there had been a bazaar held in the Town Hall organized, amongst others, by the retiring Matron, that raised £60 and that had been considered a success at the time). The monies were raised to endow a cot at the new Kershaw Children's hospital, part of Ashton Infirmary. Cousin Maggie presented herself at the Editor of the Herald's door two days later. He referred to the knock as being "gentle yet imperious". He had been sitting in his 'sanctum sanctorum', he said, disconsolately surveying his trusty shears and paste pot, (imagine the editor of the Times doing such today) when his wife appeared.
" ----But sit down you must be tired." "I am - very tired." "But you appear lively enough." "I should think I am lively. I have come to be interviewed." "Have you something to say that cannot be said in your own column?" "I have. I am worth the space." Good for her - obviously a Loreal moment. How can we bid thee farewell Old Year? Thou hast brought others to fill their place. In manhood we question and seek forth its source. like the setting of sun at close of the day. Like the pale yellow leaf will succumb to the blast. So farewell Old Year, Why must we bid thee stay? Like all we love Thou too must pass away. Glide thou along the noiseless tread. And swell the ranks of years long dead. Its bidding us be of good courage, spring and flowers will come again! See along the hedgerows gleaming, herald of the coming spring! There with calm unfaltering finger. Nature writes in letters clear. Promise of the earth awaking from its sleep so dull and drear. There a tiny blue eyed speedwell meeting the sun with timid look. See those crocus so shyly peeping through the snow clad earth. And those snowdrops, pure and lovely - nature twas who gave them birth. And she keeps them near her bosom, shelters them so warm and kind. Lest returning winter sear with its cold biting wind. Sheds a light through all the woodland, it whispers "Spring is nigh." Hark! The birds have caught the message - see that feathered speck arise. 'Tis the priest in grey apparel chanting anthems to the skies. Soft, melodious, clear and dulcet bugle of advancing spring. Subsequently she often wrote poems and little stories in the children's column she created in the newspaper under the name Cousin Maggie. I only found one or two more poems in the poetry column with the signature M Constance Morton but I suspect (although I will never be able to prove it) that she wrote a lot more under the ubiquitous 'anon', and there were a lot of them over the years. She wrote the 'Heralds of Spring'. In the April of 1891 and she gave birth to our beloved author H V Morton in June 1892 and all during the year following his birth there appeared a poetry practically a week and certainly two per month relating to babies, baby curls, a particularly nauseating one about ten baby toes, lullabies and kissing baby's face and imprinting her face on his memory for future reference - all a bit much when you think about the infant mortality level in those dates it must have been very unfeeling to some readers. He has not strength to hold a pen. Because he wants not any. A King from childish guile. He governs night and day. And I am one of them God bless him. yet very endearing. Maggie was living a very privileged Victorian lifestyle but remember in the April of 1892 even the Chief Constable had opened a soup kitchen and in the September the colliers of Ashton Moss opened one too, for the poor in Ashton. It was the abject poverty and the plight of the children of Ashton that really galvanized Maggie and made her the spirit she was. In June 13th 1891 she writes for the first time under a column labelled "Chats with children"
With the permission of the Editor, I want to ask you a question. It is this - Could we not have in Ashton, Stalybridge and surrounding districts a band of boys and girls determined to be kind to one another, helping those who are weaker than themselves, being kind to old people, also to the poor and never cruel to dumb animals? To fully illustrate what I mean I will tell you something I saw quite recently. Near the gate of the Parish Cemetery in Ashton I saw a band of boys - yes and girls too - teasing and annoying an old woman who sells chips for lighting the fire, and who I think goes by the not very dignified title of 'Chip Mary Anne'. Many of you, I dare say, know whom I mean. Well those children were throwing little stones and bits of chips at the poor old creature, greatly to her discomfort and annoyance and I regret to say greatly to their own enjoyment. Now there is not a prettier sight and none more gratifying than to see boys and girls enjoying themselves, and I would be the very last to curtail their pleasure; but when their own enjoyment means pain and annoyance to a fellow creature, I have no hesitation in saying that we must stop it at once. That poor woman is old and has to earn her living and so has quite enough to bear without our adding anything more by being unkind to her. Some day I will tell you more about the little society which I wish to see formed and which I want you to christen 'The Kind Hearted Band' - a very pretty and expressive name I think. And signs it 'Cousin Maggie'. Little did she know what she was creating and just HOW well she would succeed. I am four years old and wish to join your Band. I send sixpence. You are welcome dear little Edith - I wish I could show your letter to the cousins just as it is, with its straight lines, drawn most likely by your mother; and one or two little jerks tell me that a hand wanted to guide mother's? Thank you for the stamps dear. Very soon Maggie realised that she was collecting monies and stamps unsolicited along with the membership of the K H B. She had already mentioned the children's hospital in her column and had advised the Ashton children to send flowers and any spare books to brighten up the patients' lives. In November 1891 she hit upon the idea of making the Ashton children pay for the privilege of joining the Kind Heated Band and the proceeds to be used to provide sustenance for the really poor children of the neighbourhood and the young patients in the hospital. This is all the more commendable when you remember she was starting her first pregnancy with young Harry. But it was her first big social mistake in the town of Ashton. She states in the interview given in 1897 that she assumed that given the 'worthiness' of the cause, ie helping the really poor children of Ashton, it would have been universally accepted and funded. She hadn't realised just how segregated the local press and its readers were. There was no way Liberals (and the Liberals were very much the dominant force) were going to support an idea forwarded by a Conservative paper. As she said in her 1897 interview: "I did not want to have any judgement in the matter at all. But even with such limits if not more tact and care were necessary to banish the feeling of suspicion which my connections with a Conservative paper gave the movement than I was at first aware of." Never write with pen and ink; it is altogether too plain and doesn't hold the mind of the editor and printers close enough to their work. If you are compelled to use ink never feel compelled to use that vulgarity known as the blotting pad. If you drop a blot of ink on the paper lick it off. ; the intelligent compositor loves nothing so dearly as to read through the smear that this will make across twenty or thirty words; we have seen him hang over such a piece of work for half an hour swearing like a pirate all the time - he felt that good. Use capital letters for, in printers' parlance "keep up as every second word"; the reader finds much fun in knocking them down again as playing a game of skittles. Don't punctuate; we prefer to punctuate all manuscript sent to us. Don't try to write plainly - it is a sign of plebeian origin and the School Board breeding. Poor writing is an indication of genius; it is about the only indication of genius that a great many men possess. Scrawl your article with your eyes shut and make every word as illegible as you can; we get the same price for it from the ragman as if it were covered in copper plate sentences. Avoid all painstaking with proper names; our proof reader knows the name of every man, woman and child in the known and unknown world and the merest hint of the name is sufficient. For instance if you write a character something like a drunken letter 's' and then draw a wavy line he knows at once it means Samuel Morrison, even though you think you mean Lemuel Messenger. It is a great mistake that proper names should be written plainly. Always write on both sides of the paper and, when you have filled up the middle of every page, trail a line up and down the margins and back to the top of the first page, closing the article by writing your signature just above the date. How we do love to get hold of articles written in this style! And how we should like to get hold of the man who sends them! Just for ten minutes alone in the woods with a revolver in our pocket. Revenge is sweet. Lay your paper on the ground when you write The rougher the paper the better. Course brown wrapping paper is best for writing your articles. If you can tear down an old circus poster and write on the pasty side of it with a pan-stick it will do still better. When your article is completed crunch the paper in your pocket and carry it for three or four days before handing in. If you can think of it leave one be page out of the middle of the article. We can easily supply what is missing and yes - love to do it - we have nothing else to do. Rather surprisingly no one appears to have taken umbrage at this advice and written in complaining of his high handiness but there again, he, being the editor, could have just quietly shredded any negative mail. Nor who is tired So that he enjoys himself. to see him put his fists in his mouth. King baby do you know all this? For in after life where will be no such adoration for you. The household will go into ecstasies. Oh dear has somebody's nose been put out of joint? He was the author of a very long running saga from April 18th 1891 to October 17th 1891 about the cotton famine called 'Evil Days' (it's another one of my things to do when I've time, that is to transcribe it. I dipped into it occasionally and I think it may be centred on Ashton but I couldn't swear to that fact. It did have, I noticed, attempts of vernacular Lancashire speech, which was very brave of him considering he was Scottish / Indian). The paper also claims he was the author of two books called 'The Missing Pearl' and 'Baron Oscar' but no evidence of these were produced in the Herald and the British Library were less than co-operative when I wrote and asked if they had copies of them, referring me on to the inevitable website, which can only be used by IT automatons of which I'm not one. It is advertised in 1892 that an Herald Annual is produced with a story called 'A Queer Story' by J T Vollam. Constance Margaret also wrote a story in this annual called 'Wheels within Wheels' under the pseudonym 'Cousin Maggie'. I tried very hard to find a copy of this annual but again failed. "Heartiest thanks were also due to the proprietors and staff of the Herald for their kindness in attending and inserting at full length a report of each ramble thus giving the public and those members who were no able to attend a very full description of the various places visited"
He wrote, for all his duration as editor, full descriptions of various long walks all in around Ashton which of course is the cross roads of Lancashire, Derbyshire, Cheshire and South Yorkshire. And great tramps there were too, ie in May 1891, 23 men went from Ashton to the Cat and Fiddle, near Buxton. In June, from Hazelhead to Bamford, on September 2nd 1894 from Ashton to Oldham along the old road, on February 27 1897 from Glossop to Hayfield, and many more. They, in themselves, would make an interesting booklet of the 'then and now' variety. His son the celebrated author H V Morton was a avid walker, obviously an inherited gene. The members of the House to which the appeal is made have for the most part no personal interests to enlist them in its favour. Many of them are too old to remember the pleasures of their 'walking days'. Some may almost consider it a mystery how anybody can wish to go up a hill if it is at all possible to walk on level ground. The exhilaration of a mountain climb, the zest of overwhelming difficulties, the sense of freedom, the buoyancy the boundless delight which are yours when you reach the top lie beyond the comprehension of their sensations. and about the walks around Saddleworth, but he had obviously had a run in with a bailiff on Kinder and this took up quite a lot diatribe in the piece. In the meantime can nothing be done by an appeal to the owners of the moors near Kinderscout? Legal rights are, of course, enforceable, but it must strike them upon reflection that there is a wide difference between such rights of property as attach to a house and garden, to cultivated lands, and even a private park, and those pertaining to open moors, miles and miles in extent, on which the hand of a cultivator was never laid and which are merely the home of wild birds. To shut out the public from these wild stretches of country, to say that no person shall be at liberty to walk least tenable form when applied to a place like Kinderscout, which is known all over the land as one of the principle features of Derbyshire and in some sense a common interest. It is one of those places which ought never have been allowed to fall into the hands of a private proprietor except on condition that it should be free of access to everybody. Let it be considered also how little would satisfy the public. Few people would care for an unlimited range over the wide moors. The chief interest attaches to the immediate neighbourhood of Kinderscout and to two or three lines of passage over it from one point to another. This cannot be considered an enormous or unreasonable concession and the actual use made of it would be so small as to cause no appreciable damage. Attach to the concession all fair conditions such as Mr Bryce has inserted in his bill, signify these by a notice-board here and there, and the public might be trusted to observe them. How absolutely they may be trusted is seen in the immunity from damage to shrub or flower enjoyed by our public paths. It is only when extreme rights are enforced that carelessness and recklessness begin. Kinderscout is only part of a larger question. North-east and South-east Lancashire is studded with vast populations and the smoky towns where they dwell are in the midst of hills and moor lands. There are delightful resorts on every side, to some of which there is unmolested access, but the same process is going on as at Kinderscout. For several editorials over the years he wrote about this vexed question of access and always in favour of more of it for the common man. We in England have only just celebrated the 80th anniversary of the Kinder Scout Mass Trespass but these ideas and feelings of freedom to roam were obviously stirring well before by men such as Joseph Morton. "Today (Saturday) many of you no doubt will turn out to see the Lifeboat Demonstration. I am told this is going to be carried out with great enthusiasm and that heaps of people intend taking part in it. The cyclist (I hear whispered in my house) intend creating a considerable sensation by a fancy dress parade. Some of the fancy dresses (if all I hear is true) will provoke great merriment. I am glad. It is only by united effort like this we can in some measure recognise the efforts of the lifeboat movement. I am sure there are few objects which appeal more strongly to all of us than the cause of the lifeboat sailors. I hope the results of the lifeboat men demonstration will be most satisfactory." Shades of young Harry (H V M) in his teenage years cycling around the lanes of Stratford upon Avon.